« Arsenal pre-season friendlies in the midst of the “49”. Despite Arsenal’s position as one of the top two, at the end of the 2000/1 season there were extreme mutterings, after Arsenal finished second for the third year running, and this time ten points behind Man U. That was the season with the 6-1 defeat to Man U which Sky seem to show lowlights of once a week through every summer. We even lost the cup final. But there was hope – and laughter in the summer of 2001 as Sol Campbell joined us from the even tinier Totts than they were before. Giovanni van Bronckhorst came from Rangers for £8.5 million. Francis Jeffers came in from Everton for £8 million deal. Junichi Inamoto and Richard Wright were also recruited. Nelson Vivas and Sylvinho left, and after a summer of talking about going, Patrick Vieira stayed. 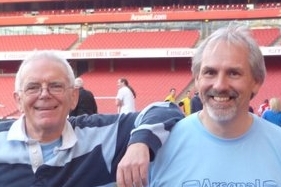 The game against Arsenal was a gentle stroll in the park, and a good day out, but sadly I have no notes on the match, and over the years the memory has faded – except for the fact that as the match finished a summer storm broke. I ran back to my car only to find a flat tyre – and remember struggling like mad to get the wheel off, this being the first flat on that particular car. Strange the tricks the memory plays. Rushden and Diamonds folded in 2011, which was a tragedy – the club was near my home and I enjoyed going there when Arsenal were not playing, sometimes taking my mum or my daughters along. A new club rose from the ashes and in 2015 AFC Rushden and Diamonds won the United Counties League. The old club’s magnificent modern stadium is still there (the reborn club play at Wellingborough’s ground), standing empty, a memory of the nine fun years when it lived and we enjoyed having a thriving local team. But enough of that… back to Arsenal. Arsenal started brilliantly in the league, suffered a home defeat, but then got themselves back together to make it one defeat in the first ten. Ultimately of course we did the double. 15 September 2001: Fulham 1 Arsenal 3. 1996: The pre-season games as Rioch was sacked and Wenger appointed. 1998: The Pre-season games. Back to sausages after the caviar.